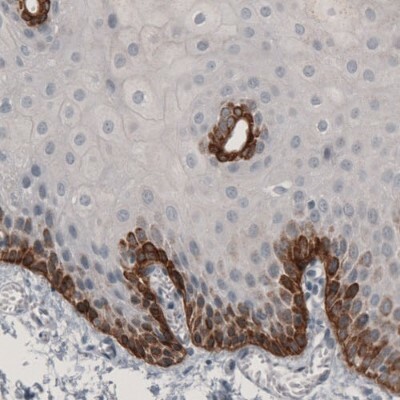 Immunohistochemistry: Laminin beta 3 Antibody (3353) [NBP2-46622] - Analysis of human prostate shows immunoreactivity in basement membrane of glandular epithelium. 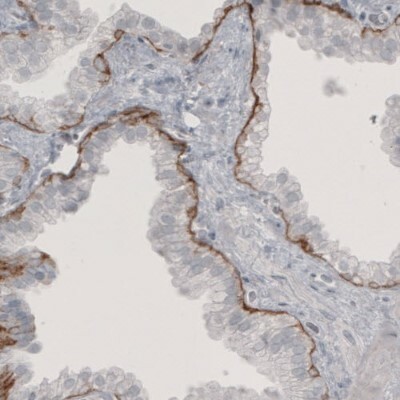 Immunohistochemistry: Laminin beta 3 Antibody (3353) [NBP2-46622] - Analysis of human urinary bladder wall shows positivity in basement membrane of squamous epithelium. Storage Store at 4C short term. Aliquot and store at -20C long term. Avoid freeze-thaw cycles. Buffer 40% glycerol and PBS (pH 7.2). "Excellent antibody, very specific and very strong signal."